Whether you want to tone, bulk-up, or add some weights to your aerobic routines, adjustable dumbbells are perfect for your needs. Unlike non-adjustable free weights that come in a few standard weight options, adjustable dumbbells give you more weight variety and allow you, instead of buying new weights as you improve, to add or adjust the weight to increase or decrease how much weight you are lifting from the very beginning. But choosing the right set for you shouldn’t be a workout! To help you decide on the perfect set for your home gym, we have put together this shopping guide including tips, advice, and all the information you need to make choosing easy. Spin-Lock Adjustable Dumbbells: These good value for money adjustable dumbbells hold weight plates together by a spinning lock. Users are able to manually add or take off various weight plates to adjust the weight. 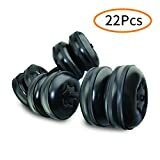 They are a convenient choice for people needing to switch between different weights during a workout and are a popular choice for home gyms. Dial-a-Weight Adjustable Dumbbells: These adjustable dumbbells are great space savers. They allow you to select a weight by using a featured dial to easily lift your desired weight, and switch between different weights easily throughout a workout. As all the remaining weight plates stay in the holder when a specific weight amount is lifted out, they offer a neat and compact solution for smaller home gyms. Selector Pin Adjustable Dumbbells: Selector Pin Adjustable Dumbbells differ from dial-a-weight dumbbells in that, instead of a dial to select a specific weight for lifting, you choose your weight by moving a pin to the desired setting, while all other weight plates are left in the holder. They are a cost effective choice for home gyms as they offer space saving as well as being good value for money. Safety: Adjustable dumbbells that are solid, quality builds are rated much higher than ones that aren’t. Easy adjustment with weight plates that fit securely, preventing weights from coming off and possibly falling on you, is a big consideration among owners. Choosing a quality brand with good reviews will ensure safer, flexible use. Storage: Reviewers favor models that include dumbbell stands, noting they find them easier to store and that it prevents their workout space being cluttered by weights. Adjustable dumbbell purchases that include stands are considered great deals, saving you money and storage space. Increments: Adjustable dumbbells with 2.5lb increments are the most popular choice among owners and are reviewed well. This is because they allow for better fine tuning of weight changes, and less extreme jumps between increases lowers the risk of injury and overwork. Consider safety. Because of the risk involved if something breaks, only buy adjustable weights from trusted, name-brand manufacturers with reputations for high quality products. 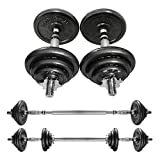 Adjustable dumbbells are an investment in your fitness and should include a sufficient warranty to ensure durability. Finding an adjustable dumbbell set that includes a stand to keep the dumbbells at a convenient height will save you money, as separate stands tend to be a pricey add on. When choosing the size of your adjustable dumbbells, consider your fitness goals as well as the size of your available workout space. More professional dumbbell sets should offer a lot more choice in weights as well as handlebars, giving you more workout flexibility. And smaller sets will make it easier for you to store, especially if you don’t have a designated gym or workout room at home. Consider the grip surface. Do you want it to be textured or smooth? Flat or convex? How you hold the dumbbells is important, so if you have a favorite grip style at your local gym, look for something similar in your home weights. What kind of lifting will you do? Weights from 40 - 50 lbs is ideal for men looking to increase general fitness, while 20 - 30 lbs is sufficient for woman doing general strength training. Bodybuilders will require heavier weights, and should look for dumbbells reaching 90 lbs to maintain their regiment when unable to attend a gym. Dumbbells that offer a maximum weight of 25 lbs are much better on your pocket and perfect for beginners, and intermediate trainers should aim for dumbbells offering between 45 and 60 lbs max weight options. When choosing the weight range of your adjustable dumbbells, consider your fitness needs and goals. Selecting a set that offers weights lower as well as and higher than your current needs will give you room to improve as well as make it possible for the whole family to use them. Also take into consideration what weight increments a dumbbell set offers, as bigger increments will mean big jumps between weights, which can cause strain. 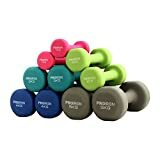 Five, two and a half, or and and a half pounds are the standard increments offered by adjustable dumbbells, and choosing one that suits your fitness level will ensure more use, growth and safety. Smaller increments are generally preferable for most home users. Adjustable dumbbell weights also come in different shapes. Hexagonal shaped weight plates don’t roll when unattended, reducing the risk of injury. Square shaped plates will enable you to lay the dumbbell on its side, allowing you to rest it on the floor, or in your lap between sets. And round plates are most similar to those found in the gym. 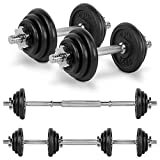 Adjustable dumbbells with plastic exteriors offer great deals for beginners and are better for smaller weight rangers. 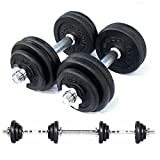 Steel plated adjustable dumbbells, on the other hand, are very durable and can take a hammering - great for people who aren’t as gentle on their equipment. Bowflex: Bowflex is the fitness equipment brand sold manufactured by Nautilus, Inc. Their Bowflex home gym is arguably the most well known home gym brand in the country, and their SelectTech adjustable dumbbells are extremely popular, thanks to their compact size and convenience. PowerBlock: PowerBlock was founded in 1991 by two fitness equipment designers who felt there must be a way to provide "fitness enthusiasts with the performance advantage of hand weights without the space and cost restrictions of old fashioned racks and dumbbells." CAP Barbell: CAP Barbell has been designing and manufacturing fitness equipment for over 25 years, and now offer 600 products in over 10 categories. CAP’s adjustable dumbbells sets allow you to fully customize your weight training.